Kate Bogart researched and designed a strategy for Booz Allen Hamilton to engage its employees in sustainability. Kate Bogart was hired to help Booz Allen Hamilton assess and improve its strategy for engaging employees in sustainability. Booz Allen has over 25,000 employees, many of whom work from the offices of their clients; additionally, Booz Allen does not own the buildings it operates out of. As a result, behavior change had the best potential to substantially reduce the company's carbon footprint. Bogart conducted focus groups, a survey, interviews and research on both competitors and market leaders to learn how employees define sustainability, what they know about sustainability at the firm and what motivates them. Bogart’s research also addressed how Booz Allen compares to competitors and which messaging strategies would strengthen the efficacy of communication with employees. In addition to other energy efficiency employee engagement programs, Bogart recommended reductions in plastic water bottle use and printing. Bogart incorporated her findings into a new communications strategy and pilot projects to improve office green team engagement. 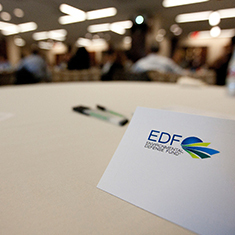 Kate Bogart, a student at Columbia University, was hired as the 2012 EDF Climate Corps fellow at Booz Allen Hamilton.